It was a long time coming, but the hot weather is making up for lost time. Saturday is predicted to be a scorcher, with the Tribune Weather Center saying that the heat index could reach 110. The city has released its guidelines on hot weather safety, as shown below. 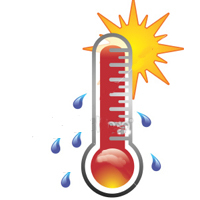 Please check on neighbors who are elderly or don't have air conditioning; and if you see someone who's living rough and seems to be in distress, please call 311 for a well-being check. Keep your body cool. Take cool showers or baths if necessary. Stay in air conditioned buildings as much as possible. If you don’t have access to air conditioning, call 311 to find the nearest cooling center. DO NOT rely on a fan as your primary cooling source. Be sure to monitor weather forecasts so you can plan your activities safely when it’s hot outside. Avoid going out in the heat during the hottest part of the day. If you do go out, wear light, loose-fitting clothing—and wear a hat to protect your head. Use sunscreen and reapply as directed on the package. If you’re exercising or working outside, pace yourself and drink more water than usual and don’t wait until you are thirsty to drink more. If possible, take breaks to cool off in an air conditioned room and always have a partner with you. Check on your relatives, friends and neighbors and share these tips with them. The elderly, those who live alone, those who are ill and young children are most vulnerable to extreme heat and humidity. DFSS coordinates the operation of cooling centers, provides transportation to them and conducts well-being checks on at-risk residents, including seniors. The Garfield Center, located at 10 S. Kedzie, is available 24 hours a day, seven days a week to connect residents to emergency shelter. In addition, the King Center (4314 S Cottage Grove) and North Area Center (845 W. Wilson) will be open as cooling centers from 10:00 a.m. to 5:00 p.m.
Additional city facilities including libraries, police stations or other structures might be made available after hours, on weekends, or on holidays, as conditions warrant. Seniors or individuals with limited mobility may call 311 to request transport to the nearest cooling center. So use common sense. I don't need to hear that from the government! Wow. I sound like a republican.